The present case report is about a 33-year-old female patient who was referred to our department for evaluation of recurrent renal stones. She had recurrent episodes of flank pain since 2002, with one session of extracorporeal shock wave lithotripsy (ESWL) done 8 years back. 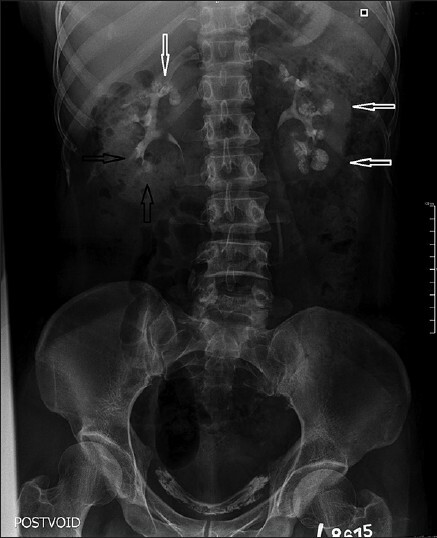 She continued to experience flank pain after ESWL with history of passing stones. On examination, she had overgrowth of the &entire right half of the body. The upper limbs measured 57 cm on the right and 54 cm on the left; lower limb measured 90 cm on right and 85 cm on the left; right foot was larger than the left by 3 cm [Figure 1]. The right half of the trunk was also larger than left; the discrepancy in the length of lower limb resulted in scoliosis with pelvic tilt. Patient recalled of having limping gait from early child hood. On evaluation, she was found to have a glomerular filtration rate of 114 ml/min/1.73 m 2 of body surface area, urine sediment was non-remarkable except for pyuria; urine cultures did not grow any organisms. Her serum sodium, potassium, calcium and phosphorus were normal and intact. Parathyroid hormone was also in the normal range. A 24 h urine collection showed hypercalciuria (560 mg in 24 h), citrate excretion in the low normal range (265 mg in 24 h) and potassium wasting (20 meq in 24 h). Urinary excretion of uric acid, oxalate and phosphorus were in the normal range. Arterial blood gas analysis was normal with corresponding urine pH of 6.5. A furosemide and overnight fludrocortisone test (1 mg fludrocortisone 10 h pre-test/40 mg furosemide on day of test) was done for confirmation of incomplete distal renal tubular acidosis (RTA); urine pH remained at 6.5 confirming a distal acidification defect. There was no evidence of proximal tubular dysfunction. 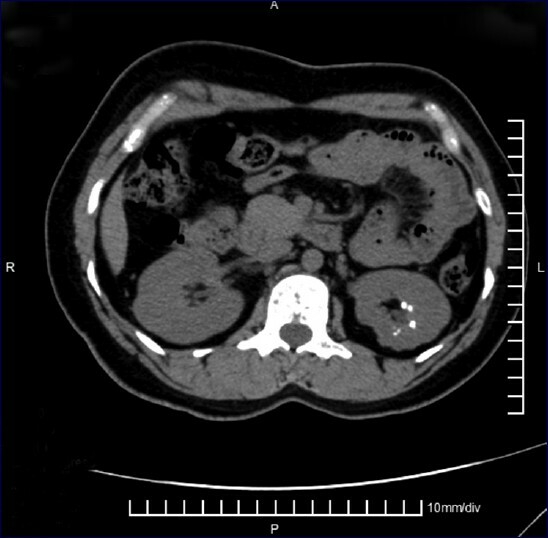 Plain radiograph and non-enhanced computed tomography (CT) of the abdomen showed left sided medullary nephrocalcinosis [Figure 2]. An intravenous pyelogram was done, which showed accumulation of contrast agent in the ectatic collecting tubules which persisted in delayed films and linear striations of contrast material radiating outward from the calyces (paint brush like appearance), [Figure 3]. As our patient does not have any childhood tumors or any other malformations associated with any of the known hypertrophy syndromes she is having IHH with MSK. To the best of our knowledge, this is the second case of IHH and MSK reported from India. 1. Indridason OS, Thomas L, Berkoben M. Medullary sponge kidney associated with congenital hemihypertrophy. J Am Soc Nephrol 1996;7:1123-30. 2. Gambaro G, Feltrin GP, Lupo A, Bonfante L, D›Angelo A, Antonello A. Medullary sponge kidney (Lenarduzzi-Cacchi-Ricci disease): A Padua Medical School discovery in the 1930s. Kidney Int 2006;69:663-70. 3. Fabris A, Lupo A, Ferraro PM, Anglani F, Pei Y, Danza FM, et al. Familial clustering of medullary sponge kidney is autosomal dominant with reduced penetrance and variable expressivity. Kidney Int 2013;83:272-7. 4. Higashihara E, Nutahara K, Tago K, Ueno A, Niijima T. Medullary sponge kidney and renal acidification defect. Kidney Int 1984;25:453-9. 5. Carboni I, Andreucci E, Caruso MR, Ciccone R, Zuffardi O, Genuardi M, et al. Medullary sponge kidney associated with primary distal renal tubular acidosis and mutations of the H+-ATPase genes. Nephrol Dial Transplant 2009;24:2734-8. 6. Ginalski JM, Schnyder P, Portmann L, Jaeger P. Medullary sponge kidney on axial computed tomography: Comparison with excretory urography. Eur J Radiol 1991;12:104-7. 7. Maw AM, Megibow AJ, Grasso M, Goldfarb DS. Diagnosis of medullary sponge kidney by computed tomographic urography. Am J Kidney Dis 2007;50:146-50. 8. Eisenberg RL, Pfister RC. Medullary sponge kidney associated with congenital hemihypertrophy (asymmetry). A case report and survey of the literature. Am J Roentgenol Radium Ther Nucl Med 1972;116:773-7. 9. Heilstedt HA, Bacino CA. A case of familial isolated hemihyperplasia. BMC Med Genet 2004;5:1. 10. Tomooka Y, Onitsuka H, Goya T, Hayashida Y, Kuroiwa T, Kudo S, et al. Congenital hemihypertrophy with adrenal adenoma and medullary sponge kidney. Br J Radiol 1988;61:851-3. 11. Scott RH, Stiller CA, Walker L, Rahman N. Syndromes and constitutional chromosomal abnormalities associated with Wilms tumour. J Med Genet 2006;43:705-15.